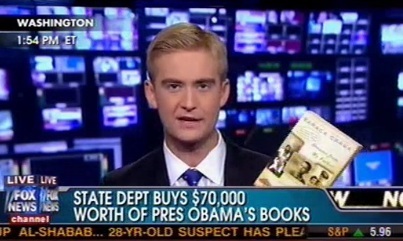 White House Says Decisions To Purchase $70,000 Worth Of Obama Books Were "Embassy Based"
On Tuesday, The Washington Times reported that State Dept. records show US embassies around the world have purchased about $70,000 copies of President Obama’s books, Dreams From My Father and The Audacity of Hope. over the course of several years, to be given as gifts and to stock libraries. During a gaggle aboard Air Force One Wednesday afternoon, Press Secretary Jay Carney told reporters that “It was an embassy-based decision” to buy those books. Fox News reported on the story earlier, before Carney’s gaggle, and pointed to a statement by a State Department spokesman that, like Carney, noted that these decisions were made by the embassies themselves, based on interest from locals, and that the White House had nothing to do with them.